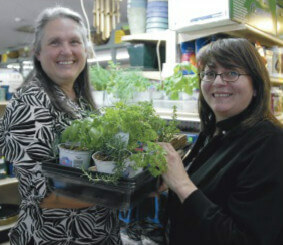 Donna Ross (shown at immediate left with retail manager Leona Espinoza) has gardened devotedly for the last 30 years. She started with a 12 ft-by-12 ft space that has since quadrupled in size. She also volunteers with the Care and Share Food Bank garden program and with Pikes Peak Urban Gardens, an organization that helps establish community gardens like the one in Old Colorado City, pictured below right. “Their goal is to start a community garden in every neighborhood in town if they can get the land donated. Then the neighborhood will take it from there,” Donna explains. It’s an important mission and one she embraces wholeheartedly. “It’s springtime, and what’s better than planting a garden?” Leona adds. “But a lot of people just don’t know where to start.” If that’s you, consider attending Ranch Foods Direct’s “Gardening 101” class to be held 1 p.m. Saturday, May 21. Participants will have a chance to get their hands in the dirt, if they want. “We’ll be talking about starting gardens in small spaces; how to prepare the bed, and how to choose and plant the seeds or seedlings. We’ve started a variety of seedlings in the greenhouse at Care and Share and will give out one or two to each of the attendees and plant the rest at the store,” Donna says. She recommends letting your tastes in the kitchen help dictate what you plant. Herbs are a great way to get started. Many of them are perennials that will return year after year. Edible flowers are also a fun addition to small gardens. “Nasturtiums are easy to grow, and you can add them to your meals,” she notes. Cherry tomatoes are a good bet for beginners since they are hardy and tend to “fruit” early in the season. Marcy Nameth, Ranch Foods Direct supplier and owner of Greenhorn Acres at Fowler, will assist the class.